Found on the Massey Knakal a real estate firm website. Text highlighted in yellow calls attention to the involvement of one of their brokers. It is probably just a bizarre coincidence that there is a large ad for Baccarat given that when the Donnell Library was sold it was replaced, in part, by a luxury hotel using using the name. 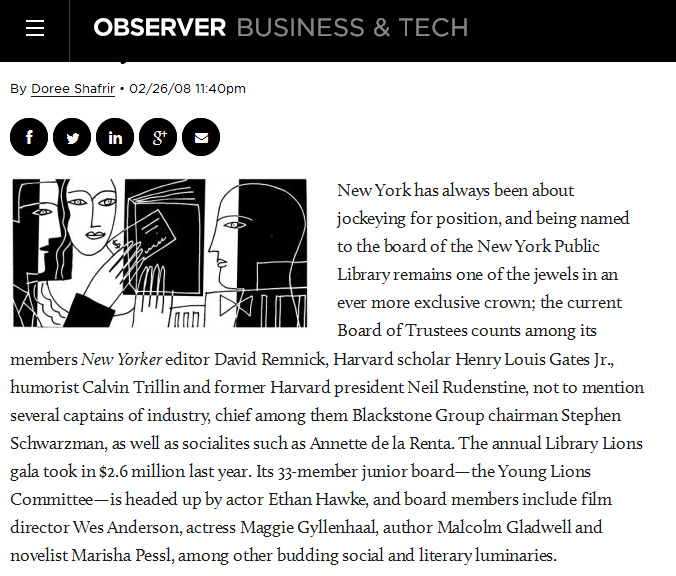 I came up with a wonderful it-only-takes-a-little-reading-between-the-lines New York Observer article from 2008 about who should consider for themselves the prospect of becoming a trustee of the Brooklyn Public Library. The article came out in February of that year, just a few months after Jared Kushner, the owner of the Observer (and Donald Trump’s son-in-law) had locked in a deal that benefitted from the sale of the Donnell Library that trustees of the New York Public Library tossed out munificently to the real estate industry.. . . The public, of course, losing out. Interestingly, I didn’t come across the article on the Observer’s site; I came across it on the site of Massey Knakal, a real estate firm, where they had posted it, highlighting text in the article to show how one of their brokers, Landon McGaw, was participating. 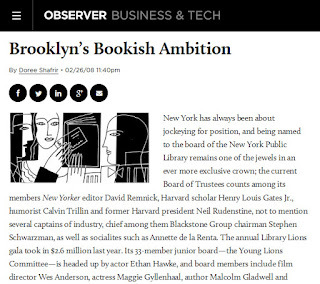 The article starts out saying that maybe getting onto the exclusive NYPL board with Stephen Schwarzman of Blackstone (the world’s largest real estate investment firm plus much more) is out of reach when you are “jockeying for position” in New York, but “what about Brooklyn” for opportunities? Put into the words on one of the people reported on there is, “a eureka-moment story about . . . . standing in Grand Army Plaza, the traffic circle outside of Prospect Park . . . the imposing main branch of the BPL, and thinking, This place is changing. . . . `Why don't I engage the library?'" Buried underneath the earnest and altruistic desire to help the library is, perhaps, a touch of social snobbery, a desire to use the opportunities afforded by the New Brooklyn to further one's station in life. Then again, that's what nearly all New York-style charity has been about, and it's unrealistic to expect this new group to be any different. And it must be said that the barriers to entry are lower. .
Janet Offensend, a fixture on the Brooklyn charitable scene for many years whose husband is the chief financial officer of the NYPL, is a library trustee who has helped marshal the Vanguard through its first few months. 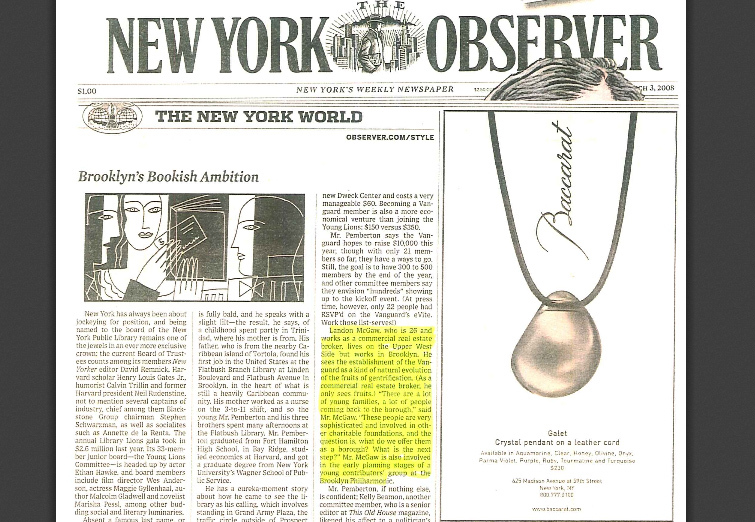 What is not noted is that Ms. Offensend’s husband David Offensend, mentioned as the chief financial officer of the NYPL, is the one who arranged the sale of the Donnell Library in a deal benefitting the aforementioned Jared Kushner, owner of the Observer. If you know that you don’t need dog whistles to figure out much more. Point of disclosure: I am a co-founder of Citizens Defending Libraries, formed in 2013 in reaction to breaking headlines about library real estate deals benefitting developers, not the public. And, as noted, on the site of real estate firm Massy Knackle. Ethan Hawke, NYPL's newest trustee, at his first trustees meeting. NYPL president Marx seated on right. 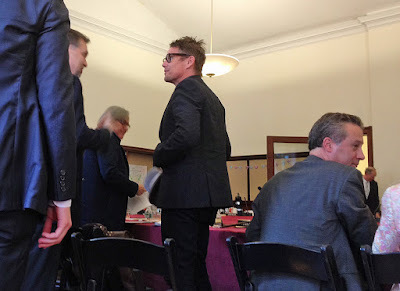 It was a change of pace, with the trustees of the New York Public Library meeting yesterday afternoon in Harlem for their trustees meeting rather than their regular 42nd Street Central Reference Library digs. . . and it was an eventful meeting. What will probably grab the headlines is that NYPL just appointed Ethan Hawke, actor (“Boyhood,” “Dead Poets Society, “Gattaca” many more), writer and novelist (“Before Sunset,” “Before Midnight,” “the Hottest State,” “Ash Wednesday”), and director (“Chelsea Walls,” “A Lie of the Mind”). What is likely to get skipped over as important, is news, delivered by NYPL Chief Operating Officer Iris Weinshall (Senator Schumer’s wife). For the first time since Donnell and the NYPL’s ultimately derailed Central Library Plan, the NYPL trustees were told that the NYPL is looking at selling another library in another concocted real estate deal. Noticing New York previously reported that the NYPL has, since at least 2008, had the idea of doing such real estate deals in “northern Manhattan” (i.e. Harlem?). Information beyond that oblique fact was not available from the NYPL. The Brooklyn Public Library president Linda Johnson recently told the City Council that all three city library systems, her BPL, the Queens Library and the NYPL, were looking at the sale of the central destination Brooklyn Heights Library (at a huge public loss) as a model for future transactions. That would bring things full circle back to the NYPL, because the sale of the Brooklyn Heights Library closely replicates the NYPL’s sale of Donnell. I just want to tell the board about another interesting initiative that has come our way: A major foundation here in the city of New York has approached the library about working with us on one of our libraries in upper Manhattan to create affordable housing on the site, but the plus for the library Is that this foundation along with HPD, which is a city agency, is prepared to provide the library with the total funding for reconstruction of the library on the site. So this would present a great opportunity for us in a facility that, uhm, has, many opportunities like the lower floor of this building, to create a brand-new library in upper Manhattan. And there will be more discussion and Tony [NYPL president Marx] and I are involved with the foundation in discussion. Thank you.
. . ."one of our libraries in upper Manhattan" . . . "major foundation"? By the “lower floor of this building” Ms. Weinshall was referring to NYPL’s 115th Street Branch of The New York Public Library where the meeting was being held, built with funds given to the city by Andrew Carnegie and opened in 1908. It's three above grounds floors plus the “lower floor,” a basement floor a community space languishing in disrepair. 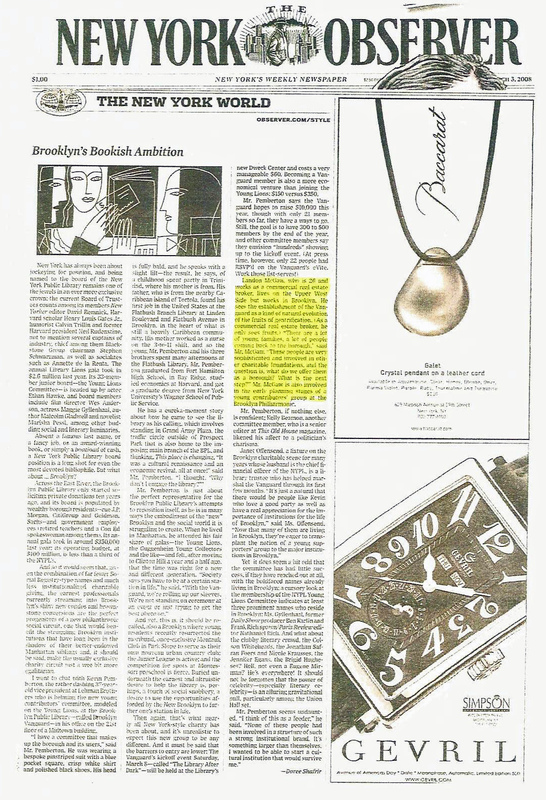 The deal Ms. Weinshall described sounds more like the BPL’s proposed Sunset Park Library sale: The Donnell and Brooklyn Heights library deals involve luxury towers going up on squashed shrunken libraries pushed down into underground space. The NYPL trustees got a report on the “replacement” for Donnell, closed in the spring of 2008 with a promise it would be replaced within 3-1/2 years. It's still not "replaced." They were told that the “53rd Street Library” (there is apparent embarrassment to call the library replacement by the name of “Donnell”) is “almost finished," which according to the other reports means may be as soon as the fall of 2016. It was not reported that the luxury hotel, the luxury condominium building, the luxury restaurants replacing the Donnell Library all opened more than a year ago in March of 2015. The trustees were told that they would be pleased with the modernity of this largely underground, largely bookless library.. . . Which is interesting because, at least once, it was suggested to the trustees in their meetings that the Donnell scheme was a mistake. There was also this update about another library sell-off and shrinkage, a modified vestige of the $500+ million derailed Central Library Plan that the NYPL still plans to follow through on: The trustees were told that they will soon see plans showing how an “entire floor” in what is now the Mid-Manhattan Library will be given up as a “replacement” for the 34th Science, Industry and Business Library (SIBL). That shrinking of space that is now devoted to the Mid-Manhattan Library is so that SIBL, a quite valuable facility as it now exists, can be sold. Discussing library usage SIBL, it was noted how SIBL, a 1996 research library, has become perhaps the most important of the NYPL’s libraries providing a focus on employment pursuit and research. There was also a discussion of library usage statistics (“metrics”). One must wonder whether there was hope behind how they were collected and presented that they might support the idea of “the changing nature of what a library is” (NYPL president Tony Marx’s words), and thereby generate acceptance for some of this real estate shuffling and shedding. The statistics seemed to report a reversal somewhat in line with recent Center For an Urban Future ideas about making libraries less about books and more about . . . whatever. Previously the reported “metrics” weren’t in line with those ideas. In 2013 the Center For an Urban Future reported that NYC library usage for the decade was way up, 59% in terms of circulation (most of which was was physical books) and 40% in terms of programs. In 2015 another report from CUF said that library space should be converted to program space?- The metrics reported to the NYPL trustees were that in the last five years NYPL program use was up 75% while circulation was actually down, mostly because streaming (Netxflix, for instance, if one can afford to subscribe to their current catalogue), is replacing the borrowing of the DVDs the library has available. Physical books are the vast bulk of the circulation, but the fraction of digital books being borrowed, a very small number, is recently, after having been introduced quite a few years ago, reportedly going up by multiples (14x). While the trustees asked about causes for the slightly reduced circulation, none of them asked whether any of it could be due to the absence of books in the libraries, the empty shelves, the broken habits of formerly more regular patrons with cutbacks in library hours and upkeep (even if some of that has just recently been somewhat remedied). Nor was it suggested to the trustees that such things might be factors to be considered. Marx’s perhaps reflexive reference to getting electronic books through “paid subscription services” rather than buying them outright (at least for your current platform) as most of us do is interesting. Libraries tend to rent their ebooks through subscription arrangements with the archival function of libraries going by the wayside. There is no preservation of history this way. They can say that they are driven to that decision by the pricing by the content providers wanting to retain control. What most people don’t know is that the ebooks that are still much less preferred by the public are actually more expensive. During the discussion the trustees were told that the NYPL had used a service (Shopper Tracker) to collect data on how many people were coming to the NYPL libraries, the amount of time different individuals were spending there and for what kind of purpose. One category of people reportedly spending more time at the library is researchers because they come to do what they cannot do elsewhere. New York State has a statute (Civil Practice Law and Rules §4509) requiring that library usage and related right of free association information “shall be confidential.” The problem is to what extent this statute has been superseded either legally, or from a just plain practical standpoint, by post-9/11 federal surveillance laws or practices. All of which is to say that Mr. Hawke has arrived at the NYPL at a very interesting time and is faced with the job of handling a multifaceted set of challenges. It is hard to resist the very bad and obvious pun to ask whether, to do that job, he will be watching like a hawk. Post Script? : It's been called to my attention that Ethan Hawke made and directed a documentary, "Seymour," about a beloved 87 year old New York piano teacher, Seymour Bernstein. One of Mr. Bernstein's piano students is New York Times architectural critic Michael Kimmelman, who in 2013 followed in Ada Louise Huxtable's footsteps influentially savaging the the NYPL's still pending Central Library Plan real estate deal: New York Times: Critic’s Notebook- In Renderings for a Library Landmark, Stacks of Questions, by Michael Kimmelman, January 29, 2013.. . Interesting?